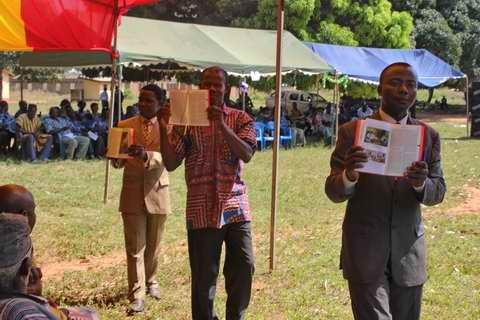 Shortly after I arrived in Ghana, I went to a celebration for the reprinting of the New Testament in the Siwu language. 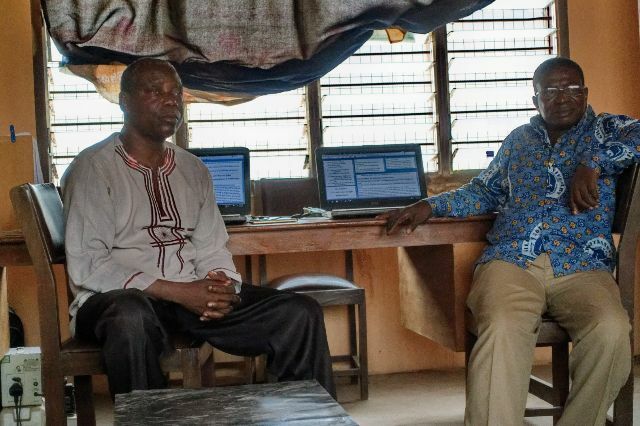 Siwu is a smaller language group by African standards – spoken by about 30,000 people. So when the translation was finished, only 1,000 were printed. But all 1,000 were sold out within weeks of the dedication. It was reprinted, and this event was to celebrate that there were now New Testaments for sale again. Many of the elements were the same as other dedications I had attended: music, speeches, recognition of officials, prayers and a procession to bring in boxes of New Testaments with a symbolic opening of the first box followed by joyous shouts, dancing. Then, when the celebration died down, a prayer. But next came something I had never seen. The very first New Testament out of the box was auctioned. The auctioneer worked the crowd until he got 600 Ghana cedis, the equivalent of $400 (at the time), for that one copy. The proceeds, I learned, would go toward continuing literacy and the translation of the Old Testament. The person with the winning bid was duly recognized for their contribution. Then the second New Testament came out of the box and it was auctioned as well. It went for 500 Ghana cedis or $335. After individually auctioning a few copies, then assistants went through the audience with copies for 50 cedis ($34), then 20 cedis ($14). Cheapskate that I am, I bought one for just 10 cedis. The chief would sign auctioned copies, so I got mine signed. Beside the signature, he would put the amount the new owner paid for his copy, thus immortalizing my tightfistedness. After the auction, copies were sold for 3 cedis ($2). 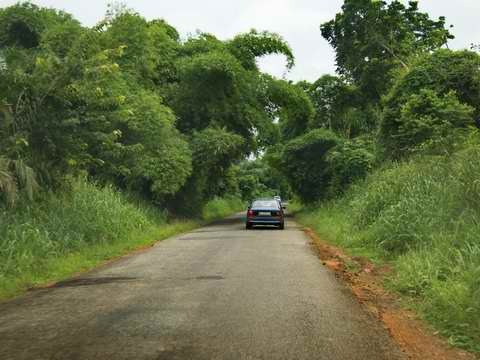 I later went to a part of Ghana where people are much poorer. There they did the same thing, but they started at 50 cedis instead of 600. I am considering raising money for translation in Ghana by having a seal-bid auction for a signed copy of the Siwu New Testament. 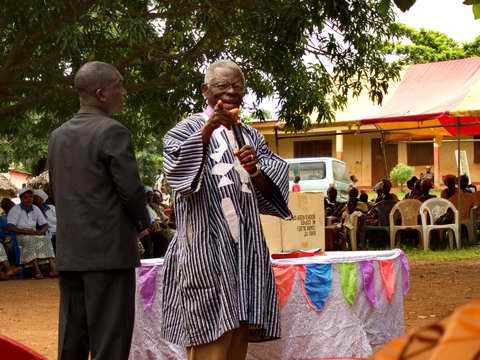 What would you pay for a copy of a New Testament in a language you do not know, but signed by the local chief, if the proceeds went toward translation work in Ghana? Hover over a photo to see a description. Click on any photo to enlarge it and start a slideshow.